Radon Monitoring Archives - Bubble Technology Industries Inc.
4. The construction of new dwellings should employ techniques that will minimize radon entry and will facilitate post-construction radon removal, should this subsequently prove necessary. The “normal occupancy area” refers to any part of the dwelling where a person is likely to spend several hours (greater than four) per day. This would include a finished basement with a family room, guest room, office or workshop. It would also include a basement apartment. It would exclude an unfinished basement, a crawl space, or any area that is normally closed off and accessed infrequently (e.g. a storage area, cold room, furnace room, or laundry room). The aim of the Canadian Radon Guideline is to remediate and reduce the radon concentration to less than 200 Bq/m3. If the radon concentration is found to be greater than 600 Bq/m3, the remedial actions are recommended to be completed in less than a year; between 200 Bq/m3 and 600 Bq/m3, the remedial actions should be completed in less than two years. This Government of Canada guideline is based on the guidance approved by the Federal Provincial Territorial Radiation Protection Committee (FPTRPC). The guideline is based upon current scientific understanding and will be reviewed and updated as appropriate. The concentration of 222Rn in air is estimated using EPA protocols for passive charcoal canisters. A charcoal canister is shipped to the client by mail or courier. After exposure for 2 days, the canister must be returned to BTI via courier for analysis. More sensitive radon monitoring systems are also available. The AT-100 damage track monitor has an exposure period of 3 to 6 months and a sensitivity of 20 Bq/m3. It is supplied as a follow-up method to the charcoal canister if additional action is indicated. 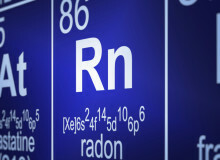 Use of the AT-100 averages out seasonal fluctuations in radon levels at a specific location.